When protecting one's home with an alarm system, deciding between professionally installed and DIY offerings is a fundamental choice. DIY options are far less known and can be more challenging to choose from, given the number of kits available. This kit contains a control panel, an emergency dialer, a single PIR, and two door/window contacts. All components are wireless, and the central panel can accommodate up to 30 Skylink branded accessories. Monitoring is not supported, however the dialer will notify up to 9 different phone numbers in an emergency. The SC-1000 kit can be purchased for about $150 USD online. 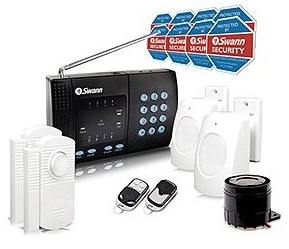 This basic kit consists of a 110 dB siren, a central controller keypad, two motion PIR detectors, two combo door/window contacts, and remote control keyfobs. This system is not expandable beyond what is furnished in the kit, and does not support a dialer or monitoring. This kit is available for around $90 USD online. This DIY system, manufactured by a familar vendor of budget analog surveillance systems, is not well reviewed. However, it is a kit carried by 'big box' retailers and is a common choice in the DIY market. 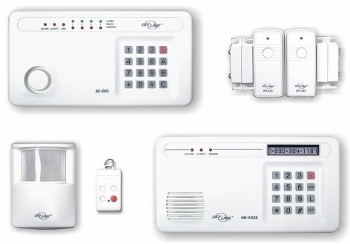 This wireless 433 MHz system is not expandable, but consists of four combo door/window sensors, two motion PIR sensors, an ultrasonic 'driveway' motion detector, and a remote keypad. This kit is available for around $120 USD online. This system includes provision to expand to 16 total sensors. 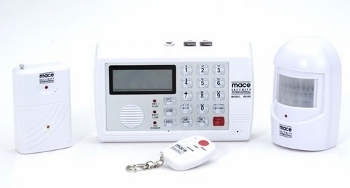 The basic kit includes a 105 dB siren, a PIR motion detector, and a combo door/window sensor, and a central keypad. The system includes a dialer unit. Interestingly, the dialer also includes 2-way audio capability, so that 'listening' in on alarms and broadcasting your voice through the central panel is possible. This kit can be purchased for about $100 online. In terms of number of sensors, one of the largest DIY systems on the market is the AAS 600. 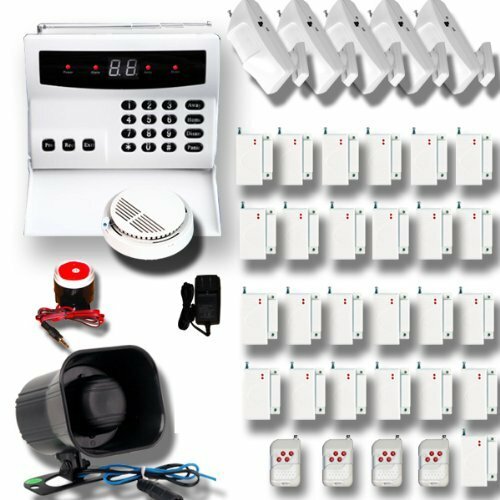 This system kit includes a central keypab control panel, five motion sensors, 25 combo door/window contacts, an indoor 110 dB siren, an outdoor 120 dB siren, a glass break detector, and 4 keyfobs. It is important to note that each sensor is powered by either AA or AAA alkaline batteries, and keeping fresh batteries in all system components will be costly and burdensome to maintain. However, the system supports up to 32 discrete alarm zones, and includes dialer support for up to 9 different phone numbers. The AAS 600 can be purchased online for around $330 online. Apartments: Swann's inexpensive #SW347-WA2 system is ideal for small living spaces with only a few openings to secure. 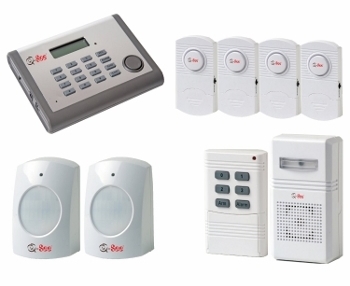 Houses: The SC-1000 kit is designed to accomodate most family sized homes, and includes dialer support for limited alarm notification. Small businesses: The large quantity of sensors and multi-zone support of the AAS 600 make it ideal for deployment for a small business. Overhead doors, offices, and warehouse spaces can all be secured by the system.